THERE was just one day of each week that worried Nasr-ed-Din Hodja. On six days he was as free as a butterfly. He could talk with his friends in the market place or ride his donkey to a nearby village. He could work in the vineyards or go hunting in the hills. He could lounge in the coffee house or sit in the sun in his own courtyard. There was nothing to hurry him to be at a certain place at a certain time to do a certain thing. But Friday was different. It was much different. That was the day when all good Mohammedans went to their mosques. 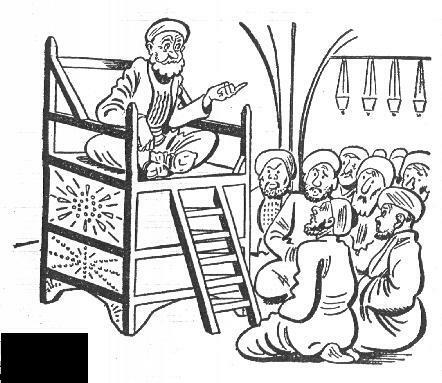 Because Nasr-ed-Din Hodja, years before, had attended the school for priests, he was expected each Friday to mount the pulpit of the mosque at a certain time and preach a sermon. That was all very well when he had something to say, but there were many Fridays when his mind was as empty as that of his own little gray donkey. It was one thing to swap stories with the men in the coffee house and quite another to stand alone in the high pulpit and talk to a mosque full of people. The men, each squatting on his own prayer rug on the floor, looked up at him with such solemn faces. Then there was the fluttering in the balcony behind the lattices, which told him that the women were waiting too. Of course, the chanting, which came before the sermon, was not hard because all the men joined in that, bowing till they touched their foreheads to the floor in the Nemaz. But the sermon - that was hard. One Friday he walked more slowly than ever through the cobblestoned streets of Ak Shehir. He saw the veiled women slipping silently past him on their way to the latticed balcony of the mosque. He saw the men in their best clothes hurrying to the mosque to hear his sermon. But what sermon? He stopped at the mosque door to leave his shoes. He pattered with the other men across the soft thick rugs. But they could squat on the rugs, while he had to climb into the high pulpit. Perhaps the beauty of the mosque would give him an idea. He looked up at the blues and reds and whites of the intricate tracery on the ceiling, but not a thought came. He looked at the rich yellows and reds of the mosaics on the walls, but there was no help there. He looked at the men's faces staring up at him. He heard the tittering in the latticed balcony where the veiled women sat. He must say something. "Oh, people of Ak Shehir!" He leaned on the pulpit and eyed them squarely. "Do you know what I am about to say to you?" "No!" boomed from the rugs where the men squatted. "No!" floated down in soft whispers from the latticed balcony, whispers not meant for any ears beyond the balcony. "You do not know?" said Nasr-ed-Din Hodja, shaking his head and looking from one face to another. "You are sure you do not know? Then what use would it be to talk to people who know nothing at all about this important subject. My words would be wasted on such ignorant people." With that, the Hodja turned and climbed slowly down the pulpit steps. His eyes lowered, he walked with injured dignity through the crowds of men. He slipped on his shoes at the mosque door, and was out in the sunshine - free until next Friday. That day came all too soon. The Hodja mingled with the crowds going to the mosque. His coarse, home-knit stockings pattered across the deep colorful rugs. He climbed the steps to the high pulpit. He looked down at the sea of solemn faces. He heard the rustling behind the lattices of the balcony. He had hoped that this week he could think of a sermon, but the carvings of the doorway did not help him, nor the embroidered hangings of the pulpit, nor the pigeons fluttering and cooing at the window. Still, he must say someLhing. "Oh, people of Ak Shehir!" intoned the Hodja, gesturing with both hands. "Do you know what I am about to say to you?" "Yes," boomed the men who remembered what had happened when they said "No" last week. "Yes," echoed in soft whispers from the balcony. "You know what I am going to say?" said the Hodja, shrugging first one shoulder and then the other. "You are sure you know what I am going to say? Then I need not say it. It would he a useless waste of my golden words if I told you something that you already knew." The Hodja turned and again climbed down the pulpit steps. He picked his way with unhurried dignity among the men. He scuffed into his shoes and escaped into the sunshine. Another free week was ahead of him. But the best of weeks end. The third Friday found him once more climbing the pulpit steps, with not a word worth saying in that solemn mosque. The ancient Arabic writing on the bright ceiling had no help for him. The flickering candles in the large round chandelier winked at him but said nothing. Even the big Koran in front of him might have had blank pages instead of its fine Arabic words and its illuminated borders. Men's faces looked up at him expectantly. Bright eyes peered through the lattices of the women's balcony. The time had come again when he must speak. "Oh, people of Ak Shehiri" declaimed the Hodja as he groped helplessly for an idea. "Do you know what I am about to say to you?" "No," came from those who were thinking of the last Friday. "Yes," came from those who were thinking of the Friday before that. "Some of you know and some of you do not know!" The Hodja rubbed his hands together and beamed down at the men. "How very fine! Now let those who know tell those who do not know!" The Hodja was humming to himself as he came down from the pulpit, two steps at a time. He nodded and smiled as he threaded his way through the men. Some thought he bowed and smiled toward the latticed balcony, but others said the good Hodja would not have made so bold. He picked his own worn shoes from the rows and rows by the mosque door. The sunshine was warm and friendly. The birds were singing and there was the fragrance of hawthorn blossoms in the air. The Hodja had not a worry in the world - not till another Friday should come around.